Rhiannon Giddens is delivering her keynote speech to a packed early morning house at AmericanaFest UK and her powerful and carefully chosen words wake us all up in more ways than one. It’s day two of panel discussions and showcase gigs in Hackney and things are getting serious. Award-winning singer/songwriter and ‘Nashville’ TV star Rhiannon talks to us about her experiences touring with and without her children, problems with international visas and the vital role Americana artists can play in changing things for the better in 2019 and beyond. It’s serious stuff, but Giddens delivers her speech with grace and a lightness of touch that has the room eating out of her hand. “I’d have gone with The Milk Carton Kids,” she laughs at one point. 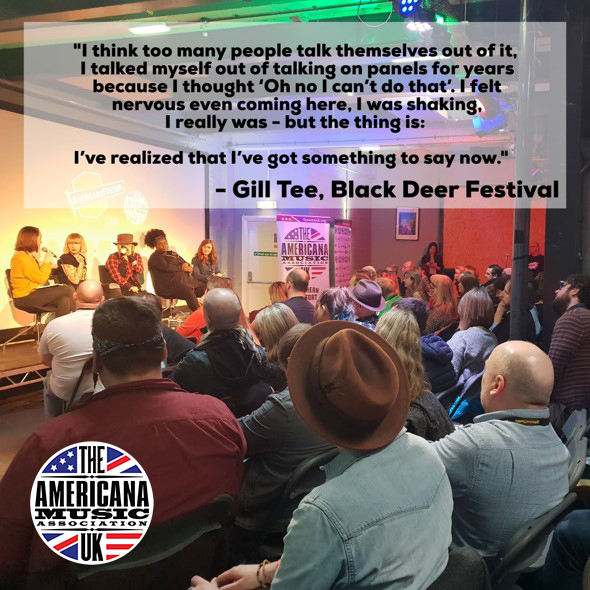 With panels on topics such as ‘Diversity In Americana’ and ‘Women In Americana Music’, it’s an inspiring day to be at AmericanaFest and no words are more inspired than those of our own co-founder, Gill Tee. Gill sat on a panel including breakout artist Yola Carter and found herself with a rousing ovation following a speech that concluded with a plea for us all to be kinder to each other. Gill’s words rang true, especially as they were delivered in a room brought together by the nourishment and care only a community such as the Americana one can provide. The music was righteous, too, as showcase after showcase had fans and industry insiders-alike dashing and darting across Hackney to hear emerging and established artists play live. Martin Harley and John Smith (both playing Black Deer this summer) were early highlights, as was an acoustic set from Asleep At The Wheel’s Ray Benson, before AMA UK newcomers Sam Morrow and Mike Farris blew us away with fantastic performances. There was no let-up as Ethan Johns with The Black Dogs delivered a thunderous, Crazy Horse-esque guitar work-out, before we crossed the street (in real and metaphorical terms) to enjoy the East Nashville blues and ballads of Wild Ponies. However, it was two Black Deer 2018 alumni who stole the show on Day Two, as Bennet Wilson Poole and Whiskey Shivers both pulled big crowds to enjoy wildly contrasting gigs. The latter’s high energy country covers set had the room shaking and the crowd dancing, as the bluegrass boogyists trashed any notions of trad and punked us all out with some righteous musicianship and attitude, finishing their set in the middle of the crowd in hoedown style. Classicists Bennet Wilson Poole, meanwhile, pulled what many Americana aficionados in the crowd were calling the much-loved band’s best performance yet out of their hat. Somehow, thanks to Tony Poole’s chiming twelve string Rickenbacker and the band’s perfect harmonies, they brought it all together and left us shouting for more just before Midnight’s broken toll. Follow us on Twitter and Instagram Stories for live #AMAUK19 updates on the final day of AmericanaFest 2019 – and for news and gossip from tonight’s big awards show!